The Woodville Hiking Trails are approximately 10 km long over privately owned land and are open year round. It will take you approximately three hours to complete all of the interconnecting loops. The outer loop is 6 km long and the inner loop is 4 km long. The trail travels along the side of the North Mountain and up to an elevation of 700 feet. The trail will take you through mixed forest, a Christmas tree farm, by a waterfall, and to a look-off with a picnic table. Extra caution, including wearing bright orange clothes, should be used when on the trails during hunting season. To get here take Bligh Road north at the flashing light in Woodville off of highway 221. The road will have two sharp turns and the trail head will be about 600m from there on your right. You may park along the side of the dirt road. 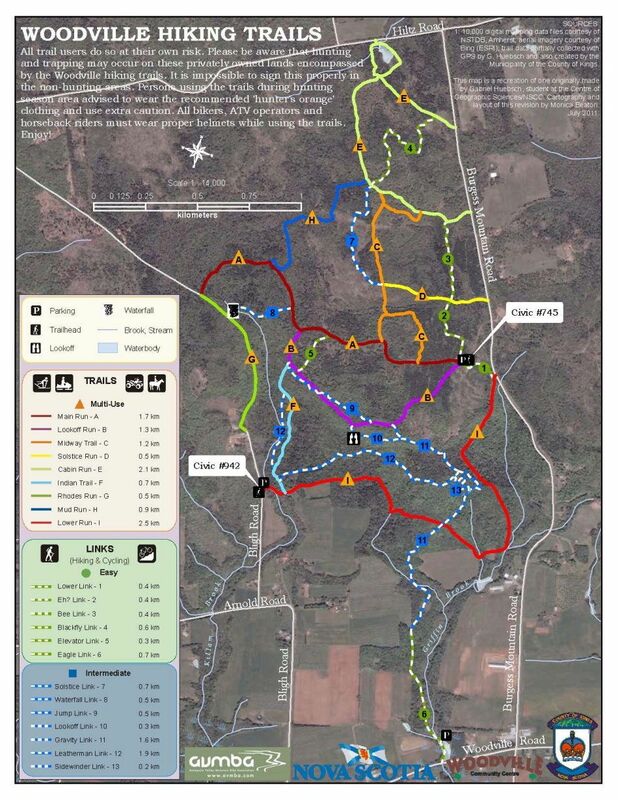 View the trail map below, or click here for a direct link.